Delbert Gordon Overlay Appliquée Bracelet size 7 1/8"
Born in Fort Defiance, Arizona in 1955, Delbert Gordon grew up in Tohatchi, New Mexico. He is a self-taught silversmith and occasionally works with gold. He has been instrumental in teaching many youngsters the craft, most notably his nephew Derrick Gordon whose rings and bracelets appear alongside his uncle's on this website. This heavily textured, deep-stamped bracelet was made with a foundational layer of silver decorated by appliquées overlaid on the foundation and further complemented by raindrops of varying sizes. If you like your bracelets hefty, this is your sort of thing. Of course, if you get the right fit on this you won't feel its weight, but you'll appreciate its heft (if that statement makes sense to you, then you know exactly what we're talking about). 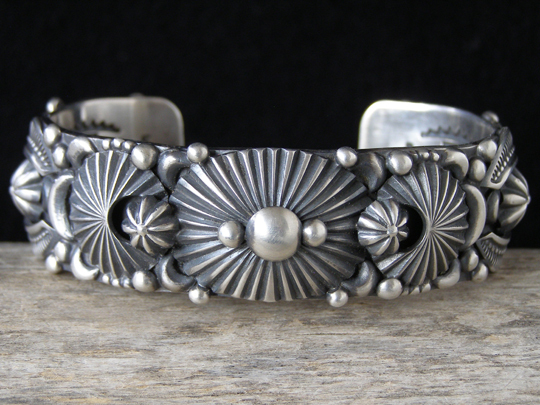 In addition to the rich texture on the exterior of the bracelet, Delbert laid deep stampwork on the inside of this fine piece. Hallmarked with a large capital D with a spur extending from it and Gordon in smaller letters beneath surrounded by a trailing banner. Also stamped Sterling inside. Terminal to terminal: 5 7/8" Gap: 1 1/4"